Well, it was an eventful round one. We lost a lot of the mass market beers—both Coronas gone, both Tecates gone, and goodbye to Dos Equis as well. The Caribbean and Central American beers performed surprisingly well—with the exception of the terrible Presidente, both Imperial and Famosa easily moved on, along with favorites such as Victoria and Bohemia. Here’s your quarterfinal bracket. Click for a larger version. And here are the round 2 matchups. This is the point in the tournament where all of the beers involved are at least decent, and the judging tended to become more difficult as a result. Our first matchup paired a classical Mexican lager in the form of Estrella Jalisco against the surprisingly complex profile of Costa Rica’s Imperial. As it was the first time around, Estrella Jalisco presented as a pleasant, crisp lager with a considerable amount of brightness, which most of the tasters appreciated. A hint of sweetness is present, and a slight touch of vanilla, in a beer that is overall quite light, easy drinking and inherently quaffable. One taster complained of a metallic tinge, but overall, not at all a bad example of what the average consumer is looking for in a Mexican lager. Imperial, meanwhile, impressed once again with its complexity and well-balanced flavor profile. There were several hop-forward lagers in this tasting, but Imperial isn’t quite like Bohemia or Famosa—it’s not overtly hoppy so much as it is subtly so, with nice hints of florals that give it a slight pilsner-like quality. Wheaty, bready malt make for a very pleasant counterbalance, and overall, Imperial proved to be just straight-up more flavorful than Estrella Jalisco could match. Another victory for Central America? Winner: Imperial, for bringing a bit more to the party. This was a tough stylistic matchup, as these two beers could hardly be more different from one another. On one side, you’ve got the surprising upstart Famosa from Guatemala, which shocked tasters in the first round by bringing a Czech pils-like hop profile into play. On the other end, you’ve got the slightly darker, maltier smoothness of Victoria. Both of these beers were tasted with more judges present than during the first round, which yielded some interesting results. All were still impressed with the unexpected uniqueness of Famosa, which once again brought an impressive array of green, hoppy, spicy notes into play, while several tasters also picked up substantial notes of lemon citrus—and one swore that there was a prominent berry/red fruit note as well. That may sound incongruous to a Mexican lager, but Famosa somehow makes this work. On the other side of the equation, Victoria is steady as they come. This beer is just smooth, smooth, smooth—if the hard-to-quantify quality of “smoothness” is your #1 area of concern, then Victoria will be your favorite Mexican lager. It gently eases you into a bit of toasty bread crust flavors, but remains not terribly assertive in terms of volume of flavor … which ultimately led to another upset. Winner: Famosa, in what was a divided vote. An Anheuser-brewed product like Landshark venturing out of the first round was certainly a novelty, but this was when Bohemia showed up to put an end to that potential Cinderella story. Suffice to say: One of these beers has a Jimmy Buffett sponsorship, and one is actually a pretty good pilsner. Although honestly, I can’t in good conscience call Landshark a bad beer—it was honestly better than many of the AB InBev products present in the macro lager tasting. Here, it was again very light and very neutral—“corny sweetness, very clean but not a ton going on,” to quote one score sheet. “Light, refreshing and with no aftertaste at all,” reads another. It’s just a beer to pound in vast quantities, and a pretty solid version of that type of beer. Bohemia, in comparison, never lacks for character. Here it was again appreciably hoppy and floral in character, with a bready/yeasty character that also stood out as a bit richer and more decadent than most of the other lagers. One of Bohemia’s strengths is not only its overall volume of flavor, but the way it checks both malt and hop boxes simultaneously. That carries it to victory here. Winner: Bohemia, although Landshark honestly put up a fight. Of all the matchups in this tournament, this was the most even pairing of two very similar beers. This honestly could have gone either way—both of these lagers are superior versions of the mold one typically associates with the likes of Corona. Picking a winner here was all about nuances. Sol was arguably the more flavorful of the two beers here, which was one of its chief assets in the first round. As then, this is a notably grainy, corny lager with similarities to several domestic lagers, with a lingering bready finish. As tasters returned to the two beers, the only thing holding it back was a faintly musty aroma, which was slightly less inviting than the relative neutral of Pacifico. As in the first round, Pacifico’s greatest strength is how very clean and approachable it truly is. In comparison with Sol it seems noticeably more crisp and a bit lighter of body, which only enhances the drinkability. There may even be a little bit of floral/herbal hop notes here that we didn’t pick up earlier, but in the end, it’s just the more refreshing of the two, and that proved all the difference. Winner: Pacifico, for its scale-tilting drinkability. The second round of eliminations continued some surprising success stories, vaulting Central American beers in the form of Imperial and Famosa over well-established Mexican stalwarts Estrella Jalisco and especially Victoria, one of the early tournament favorites. 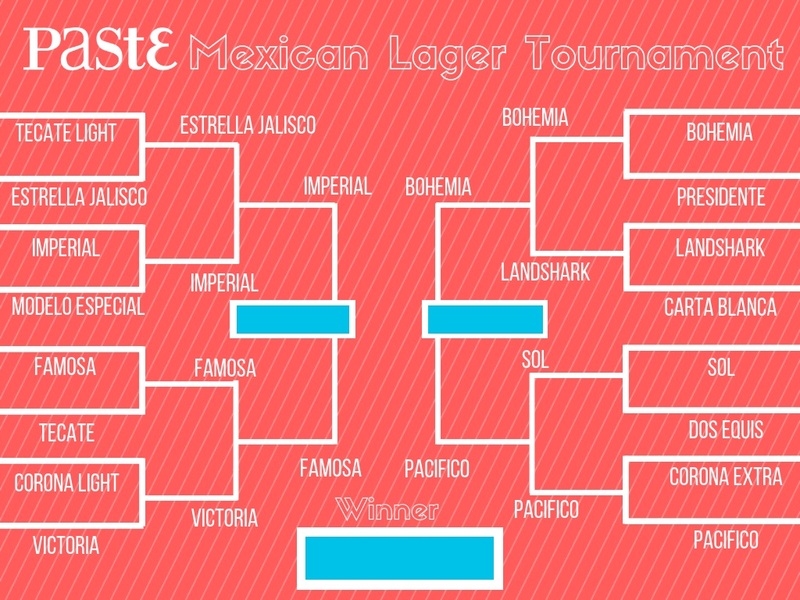 On the other side of the bracket, classic Mexican beers advanced, with Bohemia and Pacifico holding their own. Here’s your updated bracket. And here are your semifinal matchups. Time for a Central American slugfest. Both of these beers were surprising crowd favorites throughout the tournament, but only one can advance to the final in the battle of Costa Rica vs. Guatemala. It’s another stylistic clash, as almost every matchup has been when it involves Famosa. In our third go-round of tasting it, Imperial is again impressive in its depth of flavor and balance. This is a beer that manages to take some of the best pieces of its competitors while leaving their weaknesses behind. It has some of the bready, yeasty character you’d find in the likes of Sol, but it’s more crisp. On the other hand, it has some of the same noble hop character you’d get in Bohemia, but it’s more muted. Regardless, this is one of those beers that everyone can agree drinks very well. And then there’s Famosa, which is just too unique to be denied. Its defining character is its greatest strength—it doesn’t taste quite like anything else in the tournament, and the novelty it represents is hard to resist. Multiple score sheets go out of their way to describe it as simply “more fun to drink,” as its spicy noble hop character continued to surprise and delight new tasters who didn’t sample it during the first round. To quote one score sheet: “Lovely mouthfeel, slight breadiness, genuinely tasty hop flavors.” In the end, that put it over the top. Winner: Famosa, putting Guatemala into the final. Another stylistic matchup, although perhaps not quite as extreme as the one on the other side of the bracket. Here, the pilsner quality of Bohemia is pitted against the supreme drinkability of Pacifico. Bohemia once again makes its name via noble hops, but also a more assertive malt presence as well, balanced nicely with slightly herbal/floral flavors and a hint of bitterness. Of the two, it’s easily the more assertive and flavorful beer. Pacifico, again, is the portrait of neutrality. Perfectly to style, very clean and crisp, there’s nothing at all wrong with this beer, although some tasters wondered how it would fare against the possibly more interesting Imperial in a head-to-head. “Solid, totally to style” reads one score sheet. “Super clean, but by contrast boring” says another. Ultimately, Pacifico’s drinkability and lack of overt flaws carried it a long way, but tasters picked the more interesting beer of the two. Winner: Bohemia, although it was actually pretty close. Here we are. 16 beers entered this tournament, and we find ourselves in a final with one world-beater and one complete surprise of an upstart. Bohemia is a beer that no one would be surprised to see in the final of such a tournament. Famosa? None of us had ever even seen a can of this beer before. It’s completely new to everyone associated with this tournament in any way. Who knew that Guatemala was producing such an interesting lager? Are there any closet Famosa fans out there who have been drinking this beer for years as some kind of secret weapon? Write to us, if that’s you—we want to learn what else you’ve been hoarding. Also, as if it needs to be said: Yes, we’re aware that the two hoppiest beers of the tasting pretty much steamrolled their way to the finals. Does it speak to our tastes? Sure, but would you really have wanted to read a Mexican lager ranking without the likes of Bohemia in it? Where would the fun be in that? If all you want is clean and crisp, Pacifico or Imperial are wonderful choices. This was a very, very close one, and a final that honestly surprised us, because before we began tasting these beers blind, we figured there wouldn’t be much mystery involved in the outcome. And then a strange thing happened: The beers blurred together, and we started to realize just how much they actually have in common. 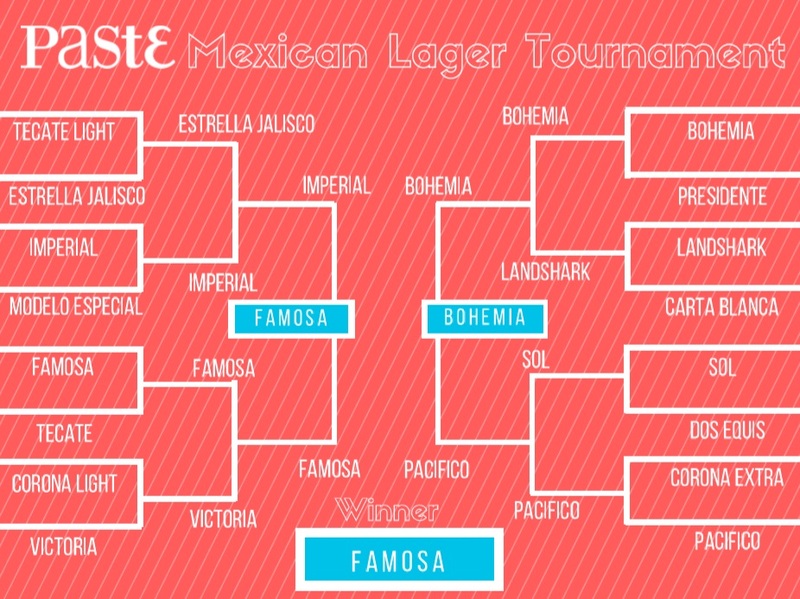 Famosa and Bohemia were both quite unique and pretty easily distinguished in previous rounds of the tournament because they were typically going up against very different beers. Put side-by-side, however, it was a dogfight, with supporters coming down on both sides of the fence. Of the two, Bohemia is a bit lighter of body and perhaps slightly less assertive, although it’s still much more flavorful than your standard Mexican lager. Famosa, on the other hand, has a slightly sweeter finish and more pronounced fruity/citrus impressions, and is likely more purely memorable. In terms of drinkability, the advantage likely rests with Bohemia, while Famosa can claim a more robust flavor profile. How do you weigh those factors? It came down to split—half of the tasters on the side of Bohemia and half for Famosa, until the tie-breaking vote was cast for the beer with the bigger, bolder flavor. Tournament Winner: Famosa, in a photo finish shocker. And there you have it! The most unlikely of outcomes, in the form of a beer that none of us had ever sampled before. Suffice to say, it’s pretty damn cool that we can find this stuff at rock bottom prices in Georgia package stores. Will the word get out? Will Famosa improbably become the next big import beer success story? … honestly, probably not. We recognize the fact that it’s an unusual beer that stands out from the Mexican lager field by offering something different, and that’s hardly the recipe for mass adoption. But we wouldn’t be surprised if the Cult of Famosa begins to grow in the U.S., in the next few years. Savvy “Mexican” lager drinkers, be aware—there’s plenty of tasty lagers from south of the border, but the very best of them might just be from Guatemala. Jim Vorel is a Paste staff writer and resident beer guru. You can follow him on Twitter for more drinking writing and blind tastings.